Like Navy corpsmen, airmen enlisting for Air Force Specialty Code (AFSC) 4N0X1 -- Aerospace Medical Service Specialists -- have a tall order ahead of them. Their career track is an umbrella for numerous duty specializations running the gamut of medical service from emergency medical technician to licensed practical nurse. Basic duties inherent in any medical environment include managing patient records, taking vital signs, and managing patient care of a team member or leader from admission to discharge. This may include postoperative care, emergency life support, and even caring for dead or dying patients and their family members. Medical service specialists also participate in and lead training exercises for other personnel. According to the ​Air Force Enlisted Classification Manual, training and instruction include "basic life support . . . periodic disaster training, fire drills, and evacuation procedures . . . [and] areas such as emergency medical technician and self-aid buddy care." Some airmen may also be called on to act as independent duty medical technicians (IDMTs), operating without the supervision of a physician in small or remote postings. In these cases, everything falls on the IDMT, including "pharmacy, laboratory, bioenvironmental, public health, medical logistics, and medical administration duties." Then, of course, an airman in AFSC 4N0X1 may also specialize as a licensed practical nurse (LPN). They may lack the officer's commission and independence of registered nurses (RNs) in the military, but an LPN holds a valued place in the nursing team. He or she performs many fundamental patient care functions, freeing RNs to concentrate on functions exclusive to their licenses such as patient assessment and teaching. 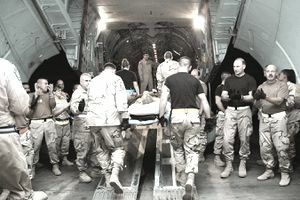 Finally, Aerospace Medical Service Airmen may perform other specialized duties such as aeromedical evacuation, allergy and immunization, neurology diagnostics, critical care, hyperbaric treatment, and hemodialysis. A high school diploma or GED puts applicants in the initial running for enlistment as Aerospace Medical Service Airmen, and the Enlisted Classification Manual also adds that it might behoove those interested in the field to have "courses in general science, biology, psychology, and chemistry" under their belts. Also, when taking the Armed Services Vocational Aptitude Battery (ASVAB), ​​Rod Powers tells us that enlistees interested in this career field should aim for a general aptitude score -- based on arithmetic reasoning and verbal expression -- of 44 or higher. A license to operate government motor vehicles is also necessary. Although you'll receive that training and licensure once enlisted, it's probably not a bad idea to already have a driver's license and some experience on the road. Finally, those moving into the neurology specialty of medical services must have "no record of emotional instability." Though you'll first attend boot camp, the real technical training begins at the Medical Education and Training Campus (METC) at ​Fort Sam Houston, Texas, where medical personnel from all service branches come together to learn and refine their skills. Training times can vary depending upon a student's progress and individual career track. Initially, it's a good bet any 4N0X1 will begin with METC's basic medical technician program, which also teaches Navy Corpsmen. Course content focuses on general medical subjects like "medical terminology, anatomy & physiology, [and] Basic Life Support," with a focus on emergency medical technician functions. Unlike corpsmen, Air Force Medical Service Specialists continue into a second phase of the program with a heavy focus on hands-on clinical experience in military medical facilities. Airmen who go the long-haul for a military career will probably find themselves returning to METC numerous times for follow-up training, especially when choosing to specialize in areas such as neurology or LPN practice. Certifications and licensures are more than just a resume-boosting perk for those who want to transition to a civilian career; they're a requirement for progression in the Air Force. For promotion to the apprentice, journeyman, and craftsman levels of AFSC 4N0X1, airmen are required to hold a current ​basic emergency medical technician (EMT-B) license. Of course, individuals may also go above and beyond by earning licensure as a paramedic. Don't forget, of course, that through experience, training, and some off-duty education, an airman in medical services also stands a good chance of earning a degree and sitting for the examination to become an LPN -- a faster-than-average growth industry in the civilian sector, according to the Bureau of Labor Statistics.